Some talent that you will find in the Talent Farm™ page of each university website are now working part-time and seeking full-time positions, some are in their first full-time position, some are seeking their first break into the industry, others are still in school. In addition to air talent, you will also find talent interested in promotions, sales, traffic and various aspects of the industry. Please note that many of these students, in addition to their primary interests, also have web and video skills, and many will take any open position you have available at your station(s) as a career opportunity. Finally...the radio industry has a “go to” place to find young talent entering the industry. The National Radio Talent System™ is designed to be a system of Radio Talent Institutes™ on college campuses across America. 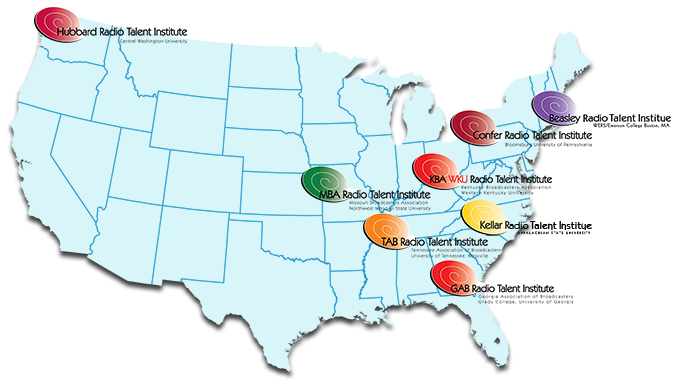 These institutes are incubators, or “farm systems”, of entry level talent, all connected through the National Radio Talent System™, allowing radio stations from all across the country to seek young talent to fill their openings. This is the only program of its kind in the world. Each university’s Radio Talent Institute™ has its own website and url, and each is connected to the National Radio Talent System™, which gives radio stations more talent to choose from when looking to hire, and to give each student/young broadcaster the opportunity to showcase his/her talents and resume to more radio stations and opportunities, not just in their region, but all across America. The first Radio Talent Institute™ is on the campus of Appalachian State University in Boone, NC and is in its eleventh year. We are in conversation with other universities now as they begin their first Radio Talent Institute™ in their region of the country. If there is a university you would like to see establish a Radio Talent Institute™, please contact us and we will pursue it with them. "Broadcasters at the highest level understand the importance of bringing new talent into the industry; even so, we have never developed an organized and systemized talent system until now" stated Dan Vallie, Founder of the National Radio Talent System™ and creator of the Radio Talent Institute™ concept.